Harman today announced that it has achieved the first-ever implementation of wireless CarPlay in vehicles. It said its infotainment system is currently being deployed for a luxury German automaker, which more than likely refers to BMW, the only automaker that currently supports wireless CarPlay as a built-in feature. 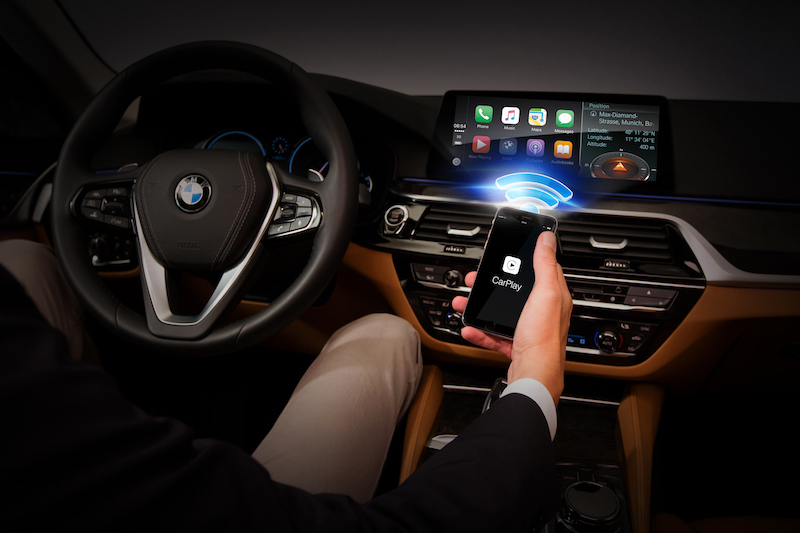 A number of BMW models have supported wireless CarPlay since late last year, and Harman's announcement comes just as the 2017 BMW 5 Series with wireless CarPlay hits the streets in the United States. Harman did not disclose plans to roll out wireless CarPlay to other automakers, but it has business relationships with several vehicle manufacturers, including Volkswagen Group, Daimler, and FCA, so it is plausible that wireless CarPlay could expand to brands such as Audi, VW, Mercedes-Benz, Chrysler, Dodge, and Jeep in the future. HARMAN is the renowned Tier 1 supplier of infotainment systems to global automakers. Our customers include Audi/VW, Daimler, BMW, Chrysler/FCA, and many others. HARMAN has pioneered the introduction of many Apple features in the past into car – iPod out, CarPlay, etc – as well as other "smart apps" such as Android Auto and Baidu CarLife, for automakers across the world. Volkswagen actually wanted to demonstrate wireless CarPlay at CES 2016, but it said Apple blocked them from doing so for undisclosed reasons. Due to confidentiality agreements, it is likely we will have to wait for each of these automakers to announce wireless CarPlay individually, but Harman and BMW have proven that it can be accomplished. Apple introduced wireless CarPlay support in iOS 9, but the majority of current systems require connecting an iPhone to the vehicle with a Lightning to USB cable. Harman's system is the first to enable wireless implementation, with the iPhone connecting via Bluetooth and data transferring via Wi-Fi. Last month, Alpine introduced the first aftermarket system with wireless CarPlay for do-it-yourself installations. The iLX-107 features a 7-inch capacitive touchscreen with LED backlighting, and it begins shipping this month for a suggested price of $900. Some resellers may offer it for cheaper as seen with other Alpine receivers. CarPlay is available in over 200 vehicle models around the world, enabling drivers to make and receive calls, access text messages, play music, get directions, check traffic conditions, and more with Siri voice commands and on-screen controls. CarPlay requires an iPhone 5 or newer. I now have a new car with carplay in it. I'm really enjoying it. As for wireless...meh....I'd rather have my phone charging, especially if I'm streaming music from Apple Music. Together with wireless charging, this is cool. Otherwise, meh. You're going to plug it in anyway to charge. Which it will likely do wirelessly. Can't wait to never have to plug my phone in again, in places I frequently use it. BMW has wireless charging too. Huh? It's an option, not standard equipment. BMWs are stripped compared to other cars of the same price point. Guessing BMW was never on your list or you would have known that. Wireless CarPlay with wireless charging is surely a goal, but even without wireless charging it is useful. If I'm on a road trip I want to charge, but if I'm just doing a quick milk run it'd be great to just hop in the car, leave the phone in the pocket, but still use CarPlay. CarPlay is not standard on BMWs, it is a $300 option. Just like smartwatches completely missed the mark, these automotive entertainment overlays are completely wrong in execution both Apple and Android. I find it funny that you can install a wireless CarPlay system for $900 when you can get a decently spec'd iPad Mini for under $300 which is probably faster and better. I remember a while back seeing some users installing them in their cars. I guess the main benefit of CarPlay is that you can hook it up to the car's audio controls, radio, and backup camera? Is that the only reason to get that instead of an iPad installation? My backup camera runs through my rear view mirror, I don't listen to the radio, but I would like to use hardware controls. Anyone still recommend doing this? I recently spent a week with a rental car that has carplay (wired, not wireless). I also used to have an iPad mounted in a non-permanent way to my personal car a few years ago. I can tell you, the experiences are vastly different from each other. Yes, Carplay is attempting to bring specific iOS apps and their content to your dash, but it integrates into cars in a much more meaningful way than sticking an iPad to your dash, and I don't just mean being able to use physical car controls to control the interface. The interface is also far different from an iPad's interface. It really is designed for car use, and glancing at important info, which makes it much safer than trying to tap around on an iPad. I recommend trying it whenever you have a chance to see for yourself how different it is. Perhaps in the end it doesn't fit your needs or budget, but it is a pretty great experience if you ask me. One thing I remember enjoying was setting different audio levels for when siri spoke to me, as in while giving me directions, vs the music I was playing from my phone. It was great to be able to crank up a song and not get jarred when siri would inevitably yell at me, as would be the experience in my ipad dash mounted car. it's a small detail, but it mattered to me.